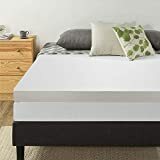 QUEEN MATTRESS TOPPER: Drift into a sounder, deeper sleep on this 4-inch queen pillow top mattress cover ideal for side, back or stomach sleepers. DUAL LAYER: A machine-washable cover holds both layers perfectly in place for unbeatable comfort that feels like you're sleeping on a cloud. GEL MEMORY FOAM: Every body is unique and deserves personalized comfort-Cooling gel memory foam draws heat away from the body to create the optimal sleep temperature. One of the most important things you can do for yourself is to get a good night’s sleep. The Sleep Foundation recommends that the average adult gets 6 to 8 hours of uninterrupted sleep every night, in order to feel fully rested, and maintain proper health. While you may be in bed 6 to 8 hours a night, an old, uncomfortable mattress could be the reason you are tossing and turning, or why you wake up with a sore back and a stiff neck. Unfortunately, a good mattress can be extremely expensive, not to mention the hassle of getting it into your house. One simple solution is to purchase a mattress topper to make your bed more comfortable, and help you get the sleep you need. This Sleep Innovations product is at the top of our list simply because it may be the most comfortable mattress topper you will ever sleep on. The reviews for this product alone are phenomenal, most of which include the phrase “like sleeping on a cloud.” Many people mention that they did not know it was possible to sleep this well until they upgraded their mattress with a topper. This is an affordable and luxurious way to get the sleep you need. 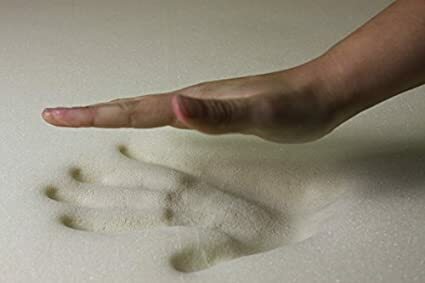 The four inches of memory foam start off with two inches of fluffy fiber filled foam. When first sitting on top of this, your body will sink into it and the memory foam will mold to the shape of your body, meeting all your curves for ultimate comfort. The entire mattress itself is covered in a soft quilted layer to add a cushion-like touch in addition to the foam insides. Underneath the fiber filled foam there is another 2 inches of cooling gel layer so you don’t have to worry about heating up throughout the night. The top two layers of memory foam also include the Sleep Innovations SureTemp technology that will keep you cool. This does not necessarily mean that you will be cold when sleeping on this mattress. It is simply designed to keep you from sweating and overheating, while allowing you to maintain your natural body temperature. Due to the gel, this topper is ideal for either those who tend to feel too hot at night, as well as those who have to pile on the covers. If you have a specific sleeping position and you are worried this mattress topper would compromise your comfort, you will still be able to sleep however you feel the most comfortable. Sleep Innovations created this mattress with the intention of it being comfortable and accessible to all type of sleepers, including stomach, back and side sleepers. No matter what way you find yourself laying during the night, the mattress topper will shape itself to your body. The memory foam, while created to keep you cool and mold to your body shape, was also designed to provide pressure point relief, which will in turn reduce your tossing and turning when you try to find a sleeping position at night. For convenience and cleanliness, there is a soft, snugly-fit cover that can be removed and washed. Secured with a zipper, you will not have to worry about it slipping off if you tend to thrash around at night. The cover is both washer and dryer safe, and will not require any specific additional washing instructions. This means that you can throw it in with the rest of your sheets. If you prefer to sleep without sheets, you will be able to sleep right on top of the mattress due to the removable cover and the soft fabric. However, the removable cover is white, and if you are concerned about stains or spills, it is recommend you keep sheets on top to avoid them. If you do decide to buy it online and are nervous about if you will like it or not, the mattress does come with a ten year limited warranty. Sleep Innovations makes the guarantee that the foam will retain its shape for the duration of its ten year warranty, and if you feel that it does not, you are free to return it for a refund. Also, the product is made and built in the United States. No matter what size bed you have, this mattress topper is available in most of them. On Amazon, you can purchase a Twin, Full, Queen, and King mattress topper for an affordable price. The entire bundle, including both the mattress topper and the removable cover is significantly cheaper than any mattress, and in the middle range for mattress toppers. If you would like a Twin size, it is $129.98, or $144.03 for a Full size, $158.29 for Queen, $164.90 for a King, or $195.69 for a California King. If you prefer to buy directly from Sleep Innovations, it is also available on their website. All options are equally as comfortable, and come with a removable cover. The entire mattress weighs 24.1 pounds allowing it to maintain firm support for your body, as well as softness that will guarantee you a good night’ss sleep. The second best pick on our list is a 3-inch memory foam topper by Visco. The biggest difference between this product and our number one by Sleep Innovations is the mattress weight. While the Sleep Innovations topper weighs a whopping 21.4 pounds, the Visco is significantly lower at only a 4 pound density. Make no mistake in thinking that this product is of a lesser quality. Not only designed for your nighttime comfort, this mattress topper was also created to make areas of your mattress that may be sagging after years of use much more comfortable and supportive. Since it is a bit thinner, this is a great option if you still love your current mattress, but would like a bit of an upgrade. With three inches of support it is guaranteed to conform to your body perfectly no matter what your body type is. Also precisely designed to relieve specific pressure points on your spine and hips, it will give you the added comfort your body needs to avoid waking up stiff and sore. If you are still partial to your other mattress, but want to purchase a topper for the weak points or additional comfort, this is designed to enhance the feel of your current mattress. The Visco mattress also comes with the additional certification of being PURGreen certified. Having this guarantee means that it was manufactured, fabricated and packaged in the United States. In addition to this, it also meets all EPA and CSPC standards of being safe and free from any harmful chemicals that may negatively affect you. The company is an independent lab that tests products to ensure they meet the qualifications of not using ozone-depleting substances and unsafe materials. Needless to say, this certification is not easy to achieve. If you are environmentally conscious, and want to avoid harsh chemicals, this is a major point of interest for many people. Some reviews comment on an odor when they first receive the mattress, however this is not due to any chemicals or toxic odors. This is simply the foam smell, and will eventually dissipate in approximately a week. 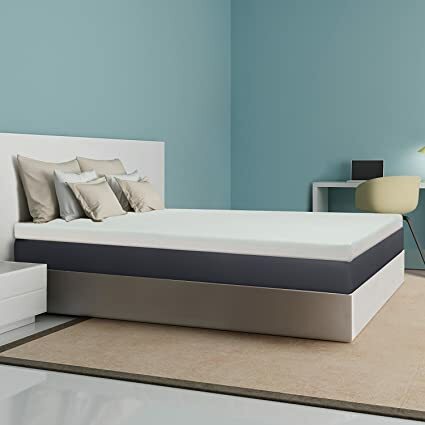 With a temperature sensitive elastic memory foam, the mattress topper will also contour, conform and cushion based on the temperature of the room. During the cooler months it will be more firm, and softer when it is warm due to the temperature sensitivity of the foam. The unique foam is also what allows it to react and mold to any warm body in just a matter of seconds. This also means that if you are on one side of the bed, only your side will change due to the pressure of your body, leaving the mattress on the other side stable for your partner if you want to get up without waking the other person. Visco also offers a warranty, although not as long term as Sleep Innovations. With a 3 year limited warranty, you can return it if you are not fully satisfied with the product. This mattress topper is also a bit less expensive than the Sleep Innovations topper, but also has more options size wise. You can get a Twin extra-large for only $95. This option is great for students going to college where the mattresses have been used by multiple people and have been worn out, or you are looking for a bit of added protection when it comes to the possibility of beg bugs. Other options include $84.08 for a Twin, $132.50 for a Queen, $198.86 for a King, $166.99 for a Full and $204.15 for a California King. No matter what size you choose, it will be equally as comfortable and supportive. The best price mattress topper is one of the most highly rated on Amazon, and will guarantee you the best night of sleep you have ever had. It will offer you amazing comfort with the body conforming memory foam, and will keep you at a stable body temperature throughout the night. This topper offers an interesting responsive active suspension that isolates motion. If you sleep in the same bed as a partner but tend to get up a lot throughout the night, this is one of the best options for you. Most mattresses have springs that will bounce the bed as soon as you shift your position, or get up. Most of the time this may wake your partner making it difficult for either of you to sleep through the night. With this foam topper, any movement on the mattress will be restricted locally to the person who moved, and won’t affect anyone else sleeping in the bed. Often, the reason we feel the need to get up at night is because we were already partially conscious due to being woken up by a noise or any shift in movement. If you are unaware of your partner shifting, or are already in a deep sleep, you are much more likely to sleep through the night without feeling the need to get up. Memory foam will increase your comfort, therefore increasing how deeply you sleep. Also created for cleanliness and dirt reduction, this mattress topper comes with a removable polyester mesh zipped cover. Since it is mesh, it may not be the most comfortable material to directly sleep on, it is highly recommend to put sheets over the topper. It may also be easy to tear if you have long fingernails. However, this does not detract from the value of the topper itself. If you ever feel the inclination, the cover can be removed and washed, but it is also recommended to let the mesh air dry so the material can retain its shape. The entire topper measures at 4 inches, so you will also be able to maintain the original integrity and feel of your own mattress. This topper is suggested for those who still like and enjoy their current mattress, but want to address parts of the mattress that may be sagging after extended use. This is also a good option if you are looking for additional joint and spine comfort. Also because of its thinner composition, you will not have to purchase different sheets to allow it to fit over the topper and the mattress. This mattress also features a 5 year warranty if you do not feel that you are satisfied with the topper, or want to send it back for any reason. As with the previous topper. The material reacts to the temperature in the room, allowing it to mold to your warm body and create ultimate comfort. In the colder months, the mattress will tend to be a bit more firm, but will automatically mold itself to your curves when you sit or lay down. The composition of the topper is 1.5 inches of memory foam on top of 2.5 inch high density foam for a firm texture that also relieves pressure on your spine, hips and neck. Following suit with a reasonable pricing, this topper is available for $92.33 in a Twin size, $116.67 in Full, $137.97 for Queen, and $156.22 in King on Amazon. Last but not least, the most affordable yet comfortable mattress topper on the list. Do not let its price fool you though, it is once again, one of the highest rated on Amazon, and has hundreds of glowing reviews. This mattress topper is a bit thinner, weighing in at 2 pounds for those who are still in love with their old mattress. Ideal for those who do not want to purchase new sheets, this will comfortably fit over your mattress, and also allow you to fit the sheets on top. It is comprised on a traditional foam that will soften any mattresses that are too firm, and will conform to any body shape, weight and position. This topper also features a unique foam by LUCID to provide you with the best possible night’s sleep you have had in a long time. The thinner material also makes it great for rolling back up, and is highly recommended for tight spaces like dorm rooms, campers or RVs. Featuring a naturally hypoallergenic material, it is great for those with sensitive skin or seasonal allergies. With this hypoallergenic material, also comes their CertiPUR-US certification. In order to get this certification, the material has to be put through rigorous chemical tests to meet certain standards. The foam in this mattress topper was made without ozone depleters or Low Volatile Organic Compound emissions for indoor air quality and for the environmentally conscious. 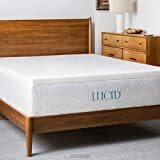 Along with this, the LUCID mattress topper is also made without flame retardants, mercury, led, formaldehyde and other heavy metals according to the CertiPUR-US website. Of course, this mattress does come with a limited 3 year warranty if you choose to return it. Don’t worry though, if you do spill anything on it, the topper can be spot cleaned with a mild detergent and a damp cloth. This is helpful because it does not come with a removable cover like some of the previous options. But it does not seem to need one since you can directly spot clean it. Since this is our budget pick, it is significantly less expensive, without sacrificing any quality for the price. LUCID also gives you many options to choose from when you look for your size. This 2 inch foam mattress topper starts out for $40.99 for a Twin size, $39.99 for a Twin XL, $54.99 for a Full, $51.99 for a Full XL, $57.99 for a Queen, $62.99 for a King, and $69.99 for a California King. No matter what size you get, you will end up spending less than a hundred dollars to significantly improve the feel and comfortability of your mattress. How worn out is your old mattress? Generally, mattress toppers are for beds that are in the middle of their life span. If you just got a new mattress and don’t like the feel of it, more than likely you still have time to trade it in for something you prefer, as opposed to dropping more money on a topper. Also if you’re bed is in very bad shape, a mattress topper might not be the answer you are looking for. Toppers are only meant to enhance the comfort of your current mattress, and will not be able to fix any extremely damaged ones. Also, if you are considering moving in the near future, make sure you will be getting the same sized bed, to avoid rendering your new topper obsolete. Assuming your mattress is in the middle of its life, you have to decide how much cushion you want in addition to what you already have. If you love your mattress, but just want a bit of extra comfort for certain pressure points, a thinner 2 inch topper would work best for you. Density is also a factor if you are interested in lessening the movement of you or your partner at night, or you have back pain when you wake up. In this case, a thicker mattress would be beneficial. Do you prefer a firm or a hard mattress? Would you prefer to have additional support for joint comfort and arthritis pain? If so, a firmer topper is great for you. It will be able to give you the extra support you need, without forcing you to spend an obscene amount of money on a brand new mattress. Maybe you prefer to sink into what feels like a cloud and have the mattress envelop you with its softness. Marshmallow-like toppers that are extremely soft and give way to pressure placed on it would be a much better option if this sounds like your preference. College students are generally on a tight budget. Concerns about mattresses in dorm rooms, that have been used by many people and tend to get worn out quickly will call for some type of topper. Also, depending on how far away you plan to go for college, it is always a good idea to keep in mind how much space the topper will take up on your commute to school. One other consideration is how long you will be living in the dorms. It just doesn’t make sense to drop a couple hundred dollars on a topper that will be used for two semesters on a Twin XL bed. If you have a permanent living situation with a bed that you plan on keeping for quite a while, then it makes sense to invest in a solid mattress topper for ultimate comfortability. All in all, it depends on your own needs and living situations. Every single person is different. Some might be extremely neat and tidy, and others, especially children, don’t have any reservations about sneaking into their room at night to munch on some midnight snacks. If you are a dropsy person, or are looking to purchase a topper that can be removed and cleaned, that is something to take into consideration. Of course, covers can be purchased separately from the topper, but you generally want to have one that meets the specific dimensions of the one you are interested in to prevent any lumps and bumps that can occur from sizing irregularities. Every persons is different, as are our sleeping habits and needs, so choosing the right mattress for you is essential for your life. Each of the four toppers have different qualities, pricing, and texture, meaning that you can choose what is right for you.